L to R: Announced at the 21st International Australasian Integrative Medicine Association Conference in Melbourne, Professor Scott Holmes, Deputy Vice-Chancellor President, Research and Development from the University of Western, accepts the generous gift of $2 million from Judy Jacka, Vice Chairperson from the Jacka Foundation or Natural Therapies with Professor Alan Bensoussan, Executive Director from the National Institute of Complementary Medicine. AUSTRALIA, Melbourne – July 18, 2015 – The National Institute of Complementary Medicine (NICM) has received a $2 million funding boost from renowned philanthropic organisation The Jacka Foundation of Natural Therapies (JFNT) to help bolster the future of complementary medicine research in Australia. The generous gift will establish the Jacka Foundation Chair of Integrative Medicine Research, in partnership with the University of Western Sydney (UWS). Establishment of the chair will help Australia evolve in a dynamic health landscape and keep pace with other world-leading institutes and universities that have already established such infrastructure. The chair position will be in line with the World Health Organization's strategy of increasing public awareness and strengthening the role traditional (indigenous) and complementary medicine plays in keeping populations healthy. 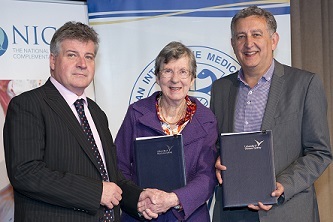 Executive Director of the National Institute of Complementary Medicine at the University of Western Sydney, Professor Alan Bensoussan, said the initiative is an exciting opportunity to advance an area of under-resourced healthcare activity and will strengthen evidence for well-informed complementary medicine use by consumers and clinicians. "Investment in a lead academic position like this one will strengthen the opportunity for greater translation from evidence into practice for all Australians. "The field of complementary medicine is extremely broad – it encompasses all traditional systems of medicine including Chinese medicine, Ayurvedic Indian medicine, Australian Indigenous medicine and others, and incorporates nutritional and herbal supplements including most vitamins and minerals that we use so regularly. "The challenge is to provide reliable guidance and information to help doctors and their patients understand when complementary medicines may be appropriate to use. "Two out of three Australians are using some type of complementary medicine regularly each year and of those, 40 per cent of the usage is for chronic illnesses that are identified as national health priorities in Australia. "Yet the funding that we invest as a country into understanding these interventions through the National Health and Medical Research Council has averaged less than one per cent over the last decade. "It is important that other support through philanthropy is given to this area, to increase the research effort." Professor Bensoussan said the establishment of the chair position will help bring Australia closer to the rest of the world's position on complementary medicine, including the World Health Organization (WHO) Traditional Medicine Strategy (2014-2023). "This is not an Australia-specific issue; strengthening the way in which evidence-based complementary medicine is integrated into care is on the radar of at least 70 per cent of the world's top medical schools, including Harvard University, Stanford University, University of Cambridge, Yale University, UCLA, Columbia University, Johns Hopkins University, Duke University, University of Toronto, Mayo and many more. "In North America there are more than 60 academic integrative medicine centres that do research and provide services in this area, and there are around a dozen integrative chairs that already exist around the world. The addition of a chair in Australia will help bring our country up to speed." Research led by the chair will contribute to judicious use of complementary medicine and better integration into conventional care. It will contribute data on safety, quality and efficacy of interventions and provide greater guidance to consumers – all consistent with Australia's National Medicines Policy. Vice Chairperson of the Jacka Foundation of Natural Therapies (JFNT) Judy Jacka said the Foundation is honoured by the creation of the Jacka Foundation Chair of Integrative Medicine Research. "This is an important contribution towards creating a synthesis in medicine that will improve the health and wellbeing of Australians," Ms Jacka said. "We are delighted to have provided our first major philanthropic endeavours to NICM which has already proved to be accomplished in Complementary Medicine research, ranked as an ERA5* institute by the Australian Government. "This university-based initiative means that the needed research into complementary therapies will result in evidenced-based medicine being applied to a wide range of health disorders, from both complementary and orthodox origins. Domestic and international candidates will be able to apply for the position in the coming weeks at www.uws.edu.au/vacancies. The successful candidate will have an exceptional track record, with evidence of research productivity, academic leadership and public engagement at the highest levels. NICM anticipates the new chair to be in place by December 2015. *Excellence in Research for Australia (ERA) is a national evaluation of research quality in Australian universities conducted by the Australian Government. It is administered by the Australian Research Council (ARC). The ERA initiative confirms that researchers at Australian universities compete with the world's best in a wide range of disciplines. ERA utilises a five-point rating scale. The rating scale is broadly consistent with the approach taken in research evaluation processes in other countries to allow for international comparison. ERA5 is the highest rating, characterised by evidence of outstanding performance well above world standard presented by the suite of indicators used for evaluation.